Just one season of excavation results in thousands of pieces of bone, antler, shell, and other animal remains, which are referred to collectively as faunal material. 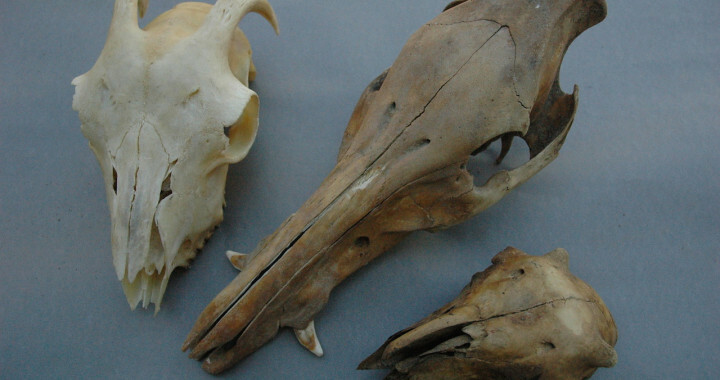 This rich body of material allows us to understand the variety of ways animals were used in the past, evaluate potential contamination levels, and examine past environmental conditions. As a team, we sort bones by their type (e.g., humerus, femur, tibia) and then record information about each individual bone. 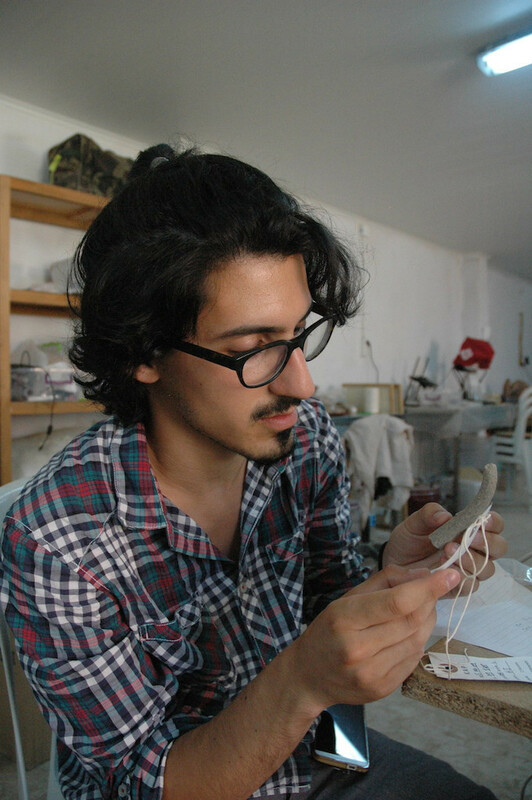 Using a variety of illustrated manuals and a collection of modern bones provided by our supervisor, Dr. Canan Çakırlar, we attempt to determine species. We frequently find domestic animals like sheep and cow, but also wild animals like deer and fish. 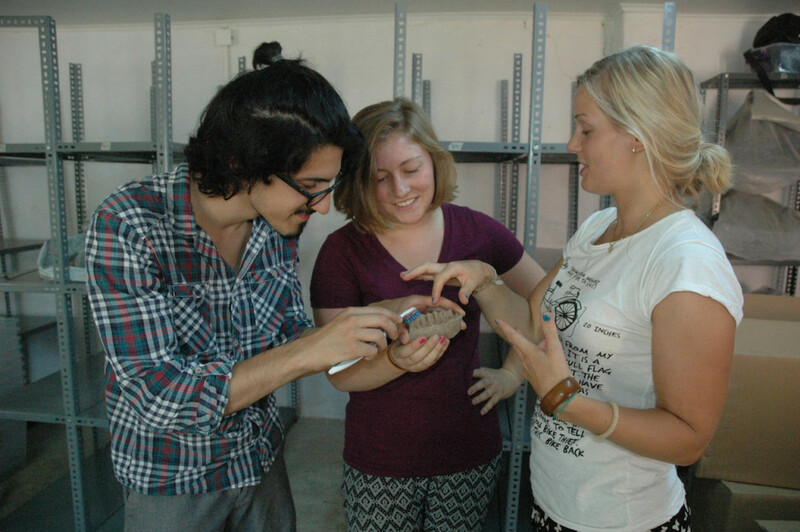 By carefully observing, measuring, and recording the excavated faunal material, we can begin to understand the age and health of animals at Kaymakçı in the past. These traits help us understand the habits of the people who used these animals for meat, wool, and a variety of other products and activities. 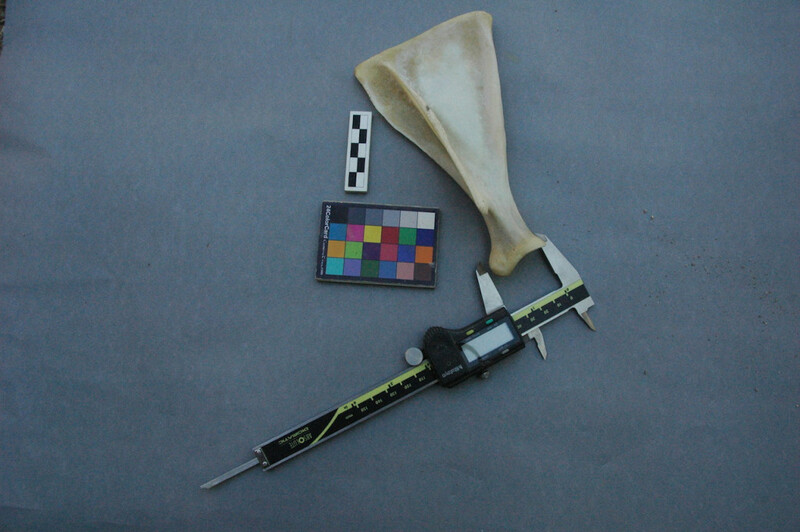 For example, bones from older sheep may indicate that they were being used for “secondary products” like wool and milk, while bones from younger sheep may indicate they were being used for meat. Additionally, pathologies in cow feet can indicate they were being used for activities such as plowing rather than consumption. Photography at Kaymakçı is a mix of traditional elements and technological innovations. 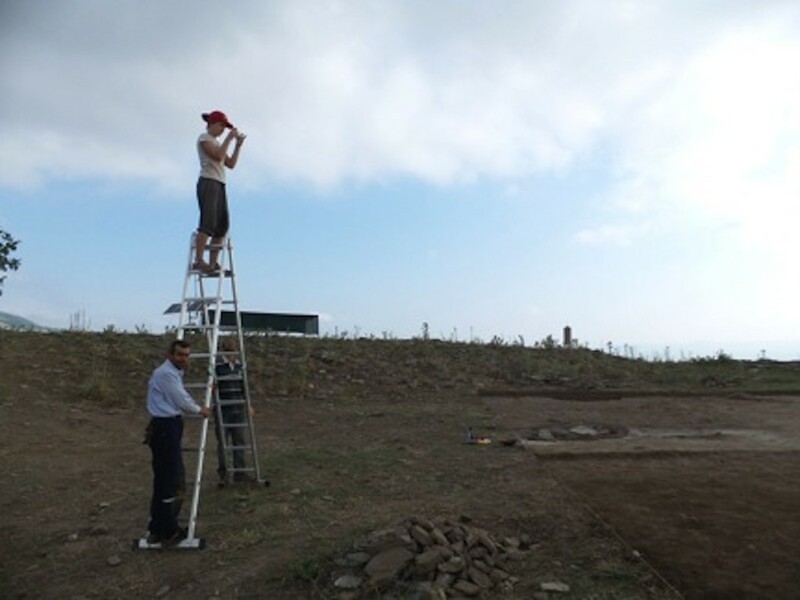 Photography is a vital part of the recording process in archaeology. Photographs produce an accurate record of deposits, features, and the relationships between contexts. There are several types of photography that are utilized on site. 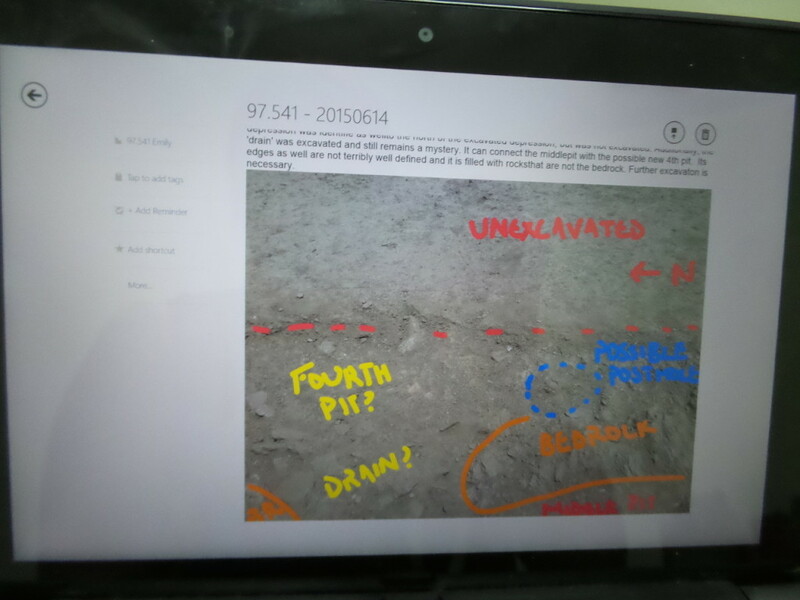 On the every-day level, the use of tablets – as opposed to the traditional pencil and paper - allow us to take real-time photographs and annotate them in the field to illustrate our daily notes and create an accurate record of our excavation techniques and thoughts. These images and notes help us to interpret the archaeological record both at the moment of excavation, and later in the lab. 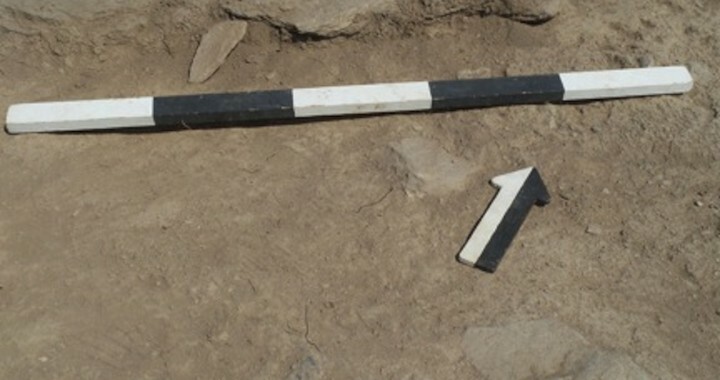 The meter stick and the north arrow are an archaeologist’s best friend! 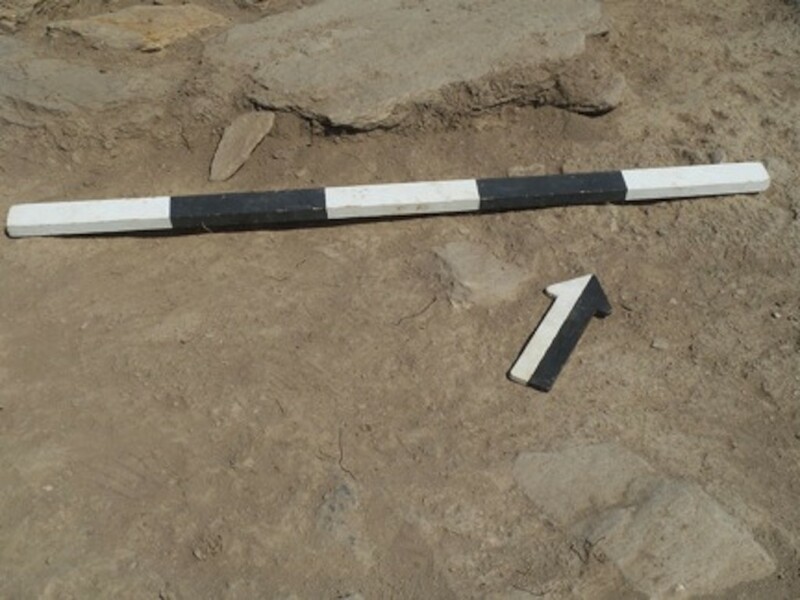 Including these two items is essential in photographs to ensure that an accurate sense of scale and direction are preserved for both formal photos for publication and progress photographs. Without these vital pieces of information, the photograph is almost worthless. The use of the drone in the field has led to a revolution in photography. 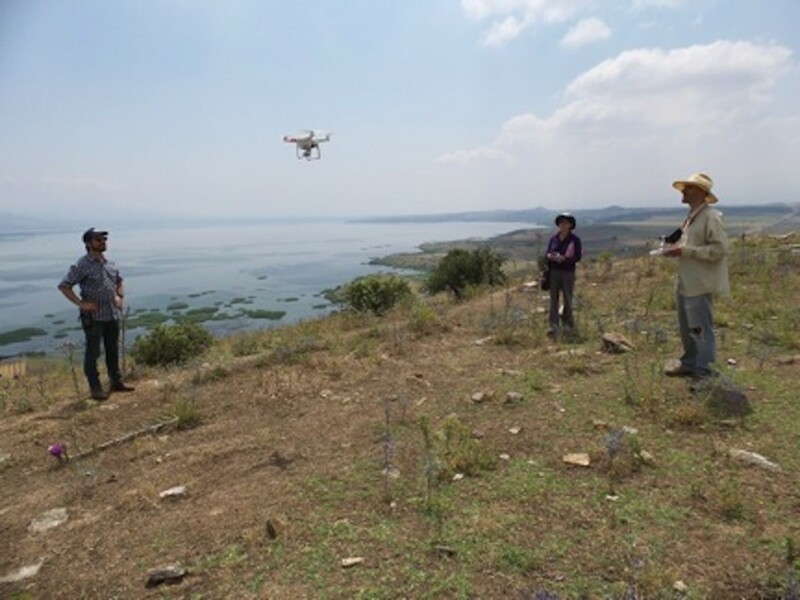 The drone is used to take aerials that allow for accurate and detailed day plans (a daily map that includes excavated areas, elevations, and important finds), as well as for “photobatching” large contexts (to create three dimensional models that portray accurate volumes, sizes, and shapes of excavated contexts). The importance of capturing all of the boundaries of a particular feature or context, as well as its relationships with contiguous contexts, can sometimes require courage and a steady hand at high elevations! I recently traveled to San Francisco to represent Gygaia Projects at the 80th Annual Meeting of the Society for American Archaeology. This year’s meeting attracted more than 5,000 archaeologists – the largest turnout in the Society’s history. The lobby of the conference hotel was a sight to behold; I’ve never before seen so many people in one room wearing hiking boots with suits. On the second day of the conference, I presented a poster on behalf of myself and coauthors Christina Luke and Christopher Roosevelt at the symposium “The Robustness and Vulnerability of Food Production and Social Change: An evaluation of interdisciplinary concepts using archaeological data, models and ethnographic observations”. This session brought together researchers from several methodological backgrounds, each of whom used food production as a framework for thinking about how past societies interacted with their environments. 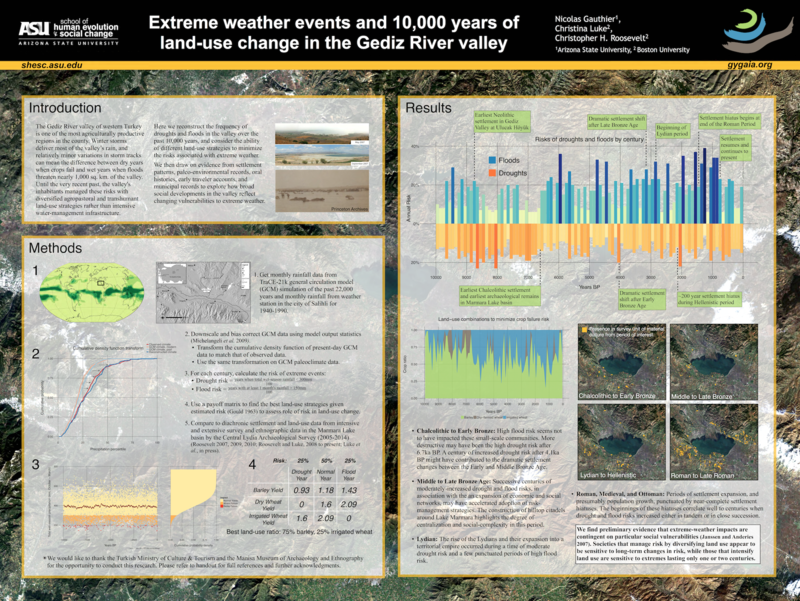 Our poster – “Extreme weather events and 10,000 years of land-use change in the Gediz River valley” – arose from recent efforts to understand how the ancient inhabitants of the Gediz River valley adapted to the risks of extreme weather. 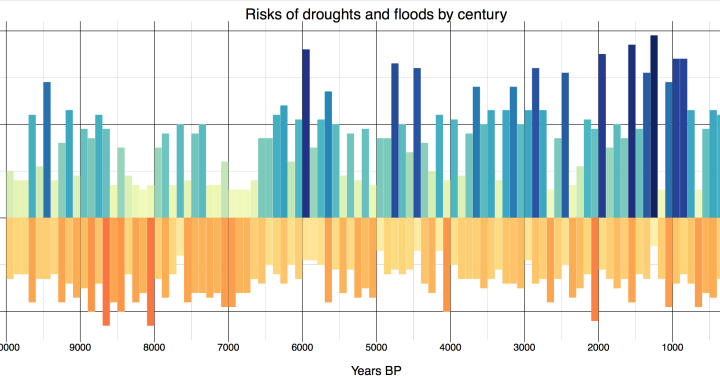 We used data from a state-of-the-art paleoclimate simulation to estimate how frequently droughts and floods would have hit the valley over the past 10,000 years. Drawing on concepts from game theory, we then explored how the risks of extreme weather might have influenced an ancient farmer’s choice of which crops to plant from one year to the next. We compared our models to data from the Central Lydia Archaeological Survey and related Gygaia Projects initiatives. We found that the impacts of extreme weather are contingent on the vulnerabilities of each particular society, and that very often what farmers might think to be the best option for minimizing risks in the short term makes them more vulnerable in the long term. Discussing these findings with our colleagues in San Francisco led to several new hypotheses that we look forward to begin testing upon our return to Kaymakçı in the weeks to come.